Our Villa is placed on top of a promontory in the middle of the sea at less then half an hour driving from Pompei, Amalfi, Positano, Sorrento, Naples and Capri. Swimming pool on top of the sea! "As featured in A Place in the Sun Magazine Oct 2010!" Trullo Patrizia is a 300 year old trullo and a romantic southern Italian farmhouse surrounded by 5 private acres of lush greenery. This 15 bedroom villa with private pool is located in Cevoli and sleeps 32 people. It has WiFi, air conditioning and a garden. The villa is near a beach. Casa de Sogni is a beautifully renovated 3 bed Tuscan farmhouse dating back to the 18th century, with a fully equipped kitchen. Relax in your own private pool overlooking tranquil sea & forest views. 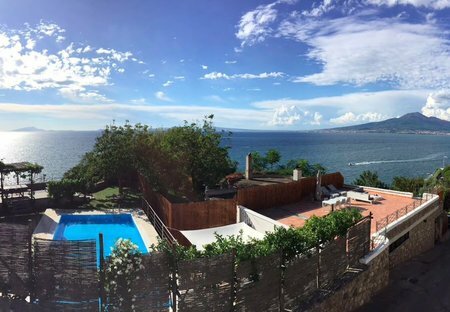 Villa Cycas is a stunning villa located in Vico Equense, the town where the Sorrento Coast begins. This 4 bedroom villa with private pool is located in Nardò and sleeps 9 people. It has WiFi, air conditioning and a garden. The villa is near a beach. Mortellito Castle is situated on the sunny island of Sicily, on a hill in the middle of olive trees and lemon trees. On a clear day it is possible to see the Aeolian Islands from its windows. Traditional country cottage. Beautiful spot offering stunning views of the countryside. Swimming pool set amongst olive groves. This 3 bedroom villa with private pool is located in Capo and sleeps 6 people. It has WiFi, air conditioning and a garden. The villa is within walking distance of a beach.